The Roseland Golf Course was designed by Donald Ross, renowned Scottish golf course architect. From 1900-48, Ross was involved in the redesign or design of over 400 golf courses in North America. Roseland Golf Course was designed by the renowned golf course architect Donald Ross (1872-1948), who transformed the North American golf course landscape with ideas from his native Scotland. Ross apprenticed at St. Andrew’s, Scotland, one of the oldest and most prestigious golf courses in the world. He was invited to the United States by a visiting Harvard University professor. In 1899, Ross built and ran the Oakley Golf Club in Boston. He continued to transform the golf landscape of North America, designing and overseeing 413 courses, including Roseland in Windsor. 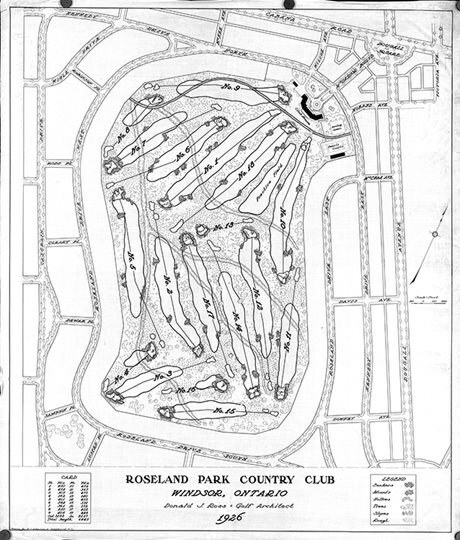 Roseland Golf Course was designed by Ross in 1926 and remains true to the original 18-hole layout. Harry James Neal, a successful local businessman and sportsman, commissioned Ross to design the course to be the centerpiece for a neighbourhood he was developing. The greens are typical Ross designs – pitched from back-to-front, with multiple tiers and with no resemblance between each green. The course was purchased by the City of Windsor in 1972 and designated under the Ontario Heritage Act in 2003. Discover how you can play on these historically significant greens by visiting the City of Windsor website. Learn more about this heritage-designated golf course on the Canada’s Historic Places website. Read more about Ross and the other courses he designed on the Donald Ross website.